Between 1874 and 1875, the Russian tsarina Maria Aleksandrovna, wife of the tsar Alexander II, spent the winter season in San Remo and thus inaugurated the tradition of Russians traveling to the riviera for the winter. As a symbol of her gratitude, she gave the town the palm trees that can still be seen along the promenade and in return, the City Council dedicated the promenade to her, henceforth called “Corso Imperatrice”, to express their appreciation to the tsarina. The Russian writer A.K. Tolstoy (a distant relative to Leo Tolstoy) spent his last winter at the tsarina’s court in San Remo, and from his letters we known much about the way in which the Russians lived on the Italian Riviera. Following the tsarina’s example, the Russian aristocracy, including members of the Imperial family, began to spend their winter season in San Remo. The Grand Duke Aleksej Michajlovic was here receiving treatment for tuberculosis in 1895 when he died at only twenty years old. He was then buried in the Cathedral of Sts Peter and Paul in San Petersburg. 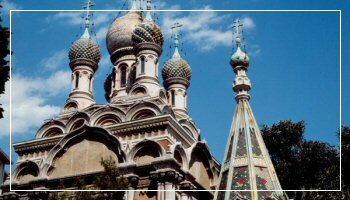 The idea to build a Russian church in San Remo was first ascribed to the Grand Duke Sergej Michajlovic, who stayed at Villa Flora in the 1890’s, and also to the tsarina Maria Aleksandrovna. At that time, many aristocratic Russian families, such as the Olsufevs, the Seremetevs, and the Demidovs, owned villas to spend the winter season on the Riviera. Many Russians suffering from tuberculosis chose San Remo to spend their winters and as a result a Russian bath, a bakery and a pharmacy were soon established in the Ligurian town. Towards the end of the nineteenth century, the idea of building a church began to spread within the Russian Colony, but the project was hampered by the lack of funds. Until 1908, when the Russian chapel in the cemetery was consecrated, the rites were sometimes held in private churches, as in Mrs Strekalova’s Villa Gloria, and in a building on Via Roma (at No. 22). In 1910, a Supervising Committee – later called the Building Committee – was led by V. K. Sabler, a senator and the former Procurator of the Saint Synod, who had spent six years in San Remo in 1882 to get healed. In his own words, he “had personally seen how necessary a church was in a town where thousands of sick people stayed”. In 1911 Sabler was appointed Procurator of the Saint Synod again and the project was thus pushed forward. On 12th March 1912, the Russian tsar Nicholas II issued a decree that approved of the Committee of San Remo and allowed for “fundraising throughout Russia”. He donated two thousand rubles. The local authorities accepted the Russian project and even promised to provide for the land on which the church could be built, although the latter did not happen. The Committee found the perfect spot for the church in the town centre, opposite the railway station, and symbolically, right at the beginning of Corso Imperatrice. In May 1912, the Committee bought this plot of land with the money raised in Russia (eighteen thousand roubles) and it was registered in Count Tallevici’s name. A. V. Scusev, a famous architect who was an expert in Russian religious architecture, drew the first sketches for the church. Scusev had restored the ancient cathedral in Ovruc and built the monastery of Martha and Mary in Moscow, and he later built Lenin’s mausoleum, too. He never came to San Remo and the plans of the church were drawn by a local architect, Pietro Agosti, with the collaboration of Antonio Tornatori, an engineer. Mr. Agosti then drew up and presented the plans to the Italian authorities for approval, devoted himself to the building of the church, and undoubtedly he can be considered as its primary building contractor. Agosti was also a member of the Town Council and when he died a street in San Remo was named after him – Via Pietro Agosti. The foundation was laid on 26th November (9th December) by father Nikolaj Akvilonov from Mentone. Soon after that, the Committee started a fundraising campaign (“Catholics, Lutherans, Baptists, and Waldensians have their own churches on the Italian Riviera, while…”) but very little money was collected. Towards the end of 1913, the church had only been partially built, but it was nonetheless consecrated and the rites were celebrated so as “to provide our compatriots with the comfort of prayers”. The Saint Synod sent the bishop Vladimir to San Remo who on 10th (23rd) December celebrated the rites of consecration of the church with the Russian clergy of Nice, Cannes, Mentone, and Rome. The ceremony was attended by the Russian diplomatic corps and the Russian Colony. During the first Liturgy, two Russian choirs – from Nice and Mentone – sang. The church was consecrated to the Saviour, to Saint Catherine the martyr, and to Saint Serafim of Sarov, though at first it had been suggested that the church be consecrated to only the Saviour, as it is usually referred today. The representatives of the Anglican and Protestant clergy celebrated with the Russian community, while the Catholic priests were not able to join in the celebrations. After the consecration of the church, the Committee had a “Russian lunch” gala offered at the Savoy Hotel during which a telegram was written to the tsar Nicholas II, who was then in Levadija (Crimea). The new church was ascribed to the eparchy of Saint Petersburg among the “churches in foreign health resorts”. Its first rector was Nevskij p. Varsonofij.